when jon and i are out, we often turn to each other, gesture with the direction of our head and whisper "snapshot! snapshot!" this means there is something that has gotten us excited but we can't talk about it unless said person or situation is out of earshot. the goal is to take in everything about the person or area so that you can relate when the time comes to discuss said event. sometimes it's just about plain old gossip, other times it's important. these weekly snapshots will be things that have inspired me throughout the week, or gotten me excited in some way. one | this was my first attempt on the first piece in my new product line - it's had to be altered since then but i've learned that when one avenue doesn't work (stupid ink!) another, better one may pop up - and i'm very excited about this mistake in particular! two | this is the second test product in my new line (due to be released on march thirtieth!). it takes a lot of time but i'm learning a lot about patterning so it's fun - and very satisfying when it's done! three | this week i popped into a gallery i've been avoiding for awhile. the gallery also happens to be a tattoo parlour and despite having three tattoos - i've never really felt at home in that type of place. but wow. some of the artwork was absolutely amazing. it has so much energy and the graphics are insane! four | this is an adorable piece of artwork (with i'm guessing, an ode to japan) that i snapped at a gallery i watch over during events. five | i had such fun with savannah from maie dae graphics doing my new blog and etsy shoppe design. i just loved it every time she sent me a draft - like this one, for my shoppe! 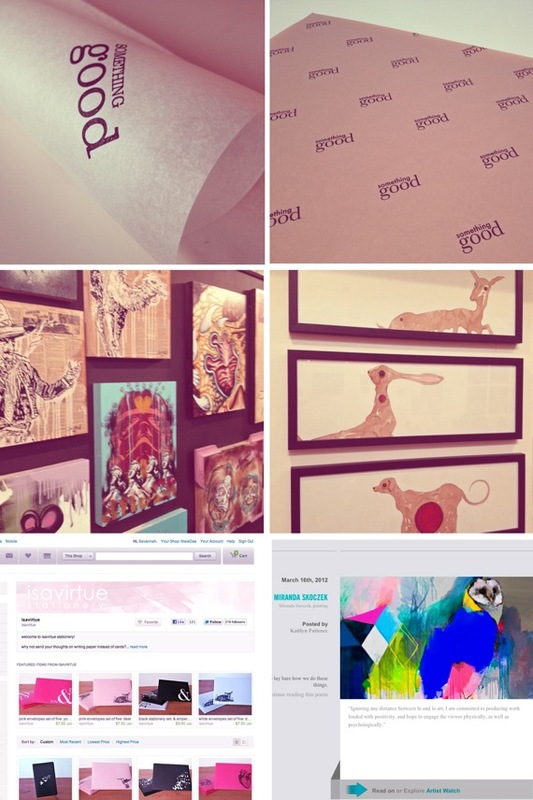 six | this was my first contributor post on the online arts journal escape into life - so i just had to screen shot it! they all look pretty arty together!! I like the code word you have, I try to unsuspiciously point with my head and most of my friends point blatantly at the person "do you mean them?" ...dear gawd lemme die! !